Express Server makes it easy to access images quickly from any device or connection, without sacrificing image quality. The added ability to download, stream and view LiDAR products from anywhere at any time will be hugely impactful for our customers. LizardTech®, the creator of MrSID® and provider of software solutions for managing and distributing geospatial content, today announced the release of Express Server® 9.5 at the 2016 GEOINT Symposium. The conference is taking place in Orlando, Fla. and LizardTech is exhibiting in booth number 414. 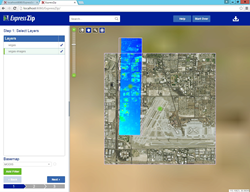 Instant visualization – Stream and view large LiDAR point cloud data quickly and easily; no more time-consuming downloads. Customized experience – Create LiDAR DEMS on-the-fly, filter by classification, save download time for your users and storage cost for you, so that end users can access the exact LiDAR data they need, when they need it. Streamlined access – Express Server 9.5 is supported everywhere WMS is supported, so you can provide LiDAR in the applications your customers use. Effortless setup – With automatic installation of prerequisites, you’ll have a streamlined out-of-box experience. GEOINT attendees are encouraged to visit LizardTech in booth 414 for demonstrations of the new features being offered. To learn more about Express Server 9.5, click here. To test a fully functional 30-day trial of Express Server 9.5 at no cost, click here. GeoExpress 9.5.1 is available in several versions to meet your imaging requirements. More information is available from LizardTech Sales. © 2016 Celartem, Inc. d.b.a. LizardTech. All rights reserved. LizardTech, MrSID, GeoExpress, Express Server, and Express Suite are registered trademarks in the United States and LiDAR Compressor and the LizardTech, GeoExpress, Express Server, Express Suite, LiDAR Compressor, ExpressView and GeoViewer logos are trademarks, and all are the property of Celartem Inc. d.b.a. LizardTech. Unauthorized use is prohibited. All other trademarks are property of their respective owners.